Who Reads What in Headwaters? If you want to try a plant-based diet, tap into the local vegan community for recipes, favourite restaurant meals and insider shopping tips. When a stack of three fluffy, golden-brown pancakes arrives at the table at Deja Vu Diner with a heavenly waft of vanilla, it announces itself as a decadent breakfast treat. But these pancakes also happen to be entirely vegan, made without eggs or milk. And thanks to a spike in plant-based eating, they’re selling like, well, hotcakes. Thick, fluffy vegan pancakes with fruit compote hold their own at Deja Vu Diner in Orangeville. Photo by Rosemary Hasner / Black Dog Creative Arts. While this old-school diner in Orangeville’s west end still serves plenty of sausages, steak and bacon strips at breakfast, owner Jennifer Betz knows firsthand how challenging it can be for a group to dine out when someone is skipping animal products. She wanted to make it easier for them. “My daughter is a vegan, and it was often hard for restaurants to accommodate her in the past,” Jennifer says of Hannah, 18. “Sometimes our only options were to leave or for her not to eat.” So when Jennifer took over the diner, she wanted to have at least one vegan item on the menu. Water and vegetable oil replace the usual milk and eggs in her pancake recipe, along with real vanilla for a touch of richness. 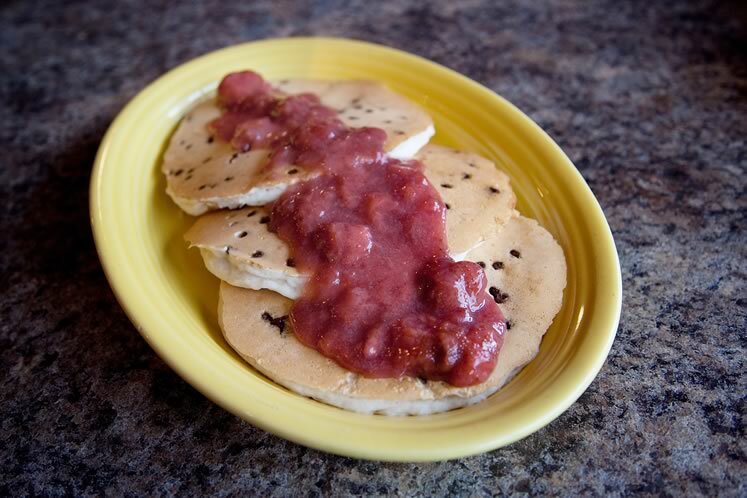 Beyond maple syrup, the optional vegan pancake toppings include non-dairy chocolate chips and homemade strawberry or blueberry topping – essentially vegan jam made without gelatin (which is derived from animal collagen). Jennifer offers soy milk to add to hot beverages and has recently starting selling the Beyond Burger – a choice she says makes her daughter extremely excited. If the Beyond Burger sounds familiar, it’s because even fast food chain A&W has added it to its menu. The patty is made by California company Beyond Meat with pea protein isolate, coconut oil and beets (for colour) to meet the growing demand for great tasting vegan fare. A recent Dalhousie University study found the number of vegetarians in Canada has risen to 2.3 million from 900,000 15 years ago. There are also 850,000 vegans – who in addition to avoiding meat also eschew dairy, eggs and honey (they may also avoid leather and other animal products in their wardrobes and homes). Together, the number of vegetarians and vegans accounts for close to 10 per cent of the population – even in rural communities such as Headwaters, where cattle, dairy and poultry farms dot the landscape. Many of the topics author Frances Moore Lappé explored in her classic 1971 book Diet for a Small Planet remain relevant, including the negative impact of meat production on the environment and the possible benefits to both the environment and world hunger if we gave up meat. Recent studies reveal more than 80 per cent of the world’s farmland is used for livestock, which provides just 18 per cent of global food calories and 37 per cent of its protein. And scientists say even the most sustainable meat and dairy farms still do greater environmental damage than any plant production. The authors of the new Canada’s Food Guide, released by Health Canada in February, are likewise urging Canadians to fill up half their diet – illustrated by a dinner plate graphic – with vegetables and fruit. They also ditched the word meat as a category header, in favour of “protein foods,” promoting nuts, legumes and tofu alongside beef, chicken and meat products. Orangeville yoga studio owners Jason Maraschiello and Laurin Wolf are dedicated vegans who amplify their choices over social media. The couple started the Orangeville and area vegan Facebook group almost three years ago. They had been part of a similar group in Guelph and wanted something comparable after they moved to Erin. “Starting this online group was a way to cultivate awareness of vegan options in our expanding community,” Jason says, adding he’d even love to see “vegan ribs” offered at local Ribfests alongside the main attraction one day. The group hosts occasional vegan potlucks and has become best known among vegans and the vegan-curious for sharing recipes, vegan ingredient finds and tips on vegan-friendly local menus (favourites include Orangeville’s Pia’s on Broadway, RJ’s Taste of Asia and Euphoria, and Mono’s Mrs. D Jerk Roti). 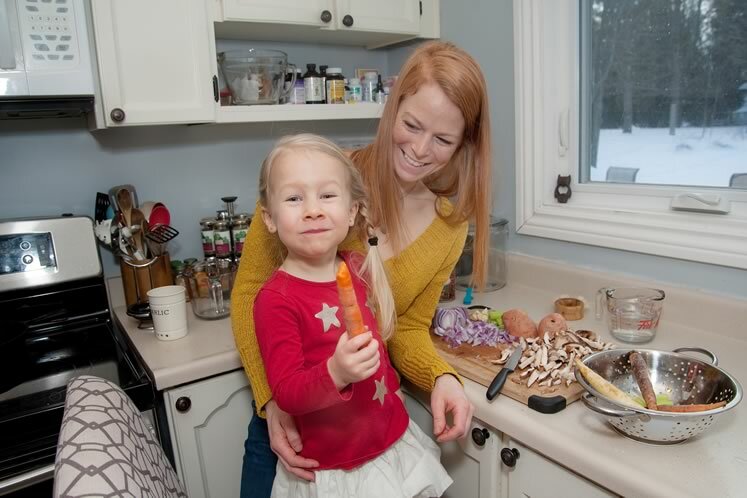 Sharah Mooy and her daughter Elia, 3, prep a plant-based dinner at their home in East Garafraxa. Sharah, who is studying to become a holistic nutritionist, shares vegan recipes and restaurant tips on her Instagram feed. Photo by Rosemary Hasner / Black Dog Creative Arts. The Meatless Mondays trend is an easy place to start, she says. Trying dairy-free alternatives to see how they sit with your family’s tummies and consciences is another. Sampling vegan baked goods or prepared frozen meals is a simple way to test the waters. Others have tapped into an aspect of veganism that could only happen in the country – rescuing animals from the food supply chain. Ali and Faith Bisram run the Green Living Organic Farm Sanctuary in East Garafraxa. Faith’s turn to veganism came about 18 months after Ali’s, all because of a visit to an animal sanctuary before they owned one. “I remember the first time Faith held a chicken, and then we stopped for dinner on our way home and she couldn’t order the chicken because it wasn’t just a meal anymore – it was Rita,” says Ali. Ali Bisram nuzzles one of the rescued sheep she and her partner Faith care for at their Green Living Organic Farm Sanctuary. Photo by Rosemary Hasner / Black Dog Creative Arts. The couple cares for 30 rescue animals, a modest number in the sanctuary world. “We are limiting our intakes to better focus on the needs of our senior and special needs residents,” says Ali. The pair hosted an informal “Veg Fest” at the farm with vendors and members of the Orangeville-area vegan Facebook group two summers ago. Growing and selling organic produce helps offset costs, and their future dreams include offering horticultural therapy. For now they still hold day jobs in municipal government, but they welcome weekend visitors and volunteers, and they are planning a 20th birthday party in May for Cocoa, one of their beloved cows – complete with vegan cake, no doubt. Add a few plant-based bites to your plate with these local options. Do you know another must-try? Let us know and share your favourites in the comments below. A traditional menu makes room for vegan pancakes, the Beyond Burger and other vegan hits. Past menu wins include tofu tacos and Thai peanut tempeh in a quinoa Bowl or sandwich, and all their soups are vegan. Check Facebook for dedicated vegan menu nights. Try a teriyaki Buddha Bowl for brunch, complete with grilled vegetarian “chicken” and coconut rice. The pub chain has an entire vegetarian section on their menu, some of which can be made vegan. Think crispy cauliflower and whole grain bowls. Yes, there’s more than one Buddha Bowl outside the GTA, along with a tofu scramble or raw vegan wrap. These producers make gluten-, soy- and GMO-free vegan cream “cheeze” from cultured Canadian sunflower seeds in original, herb and garlic, and sriracha flavours. Available at Harmony Whole Foods and Sobeys in Orangeville, Foodland in Caledon East and Garden Foods in Bolton. Rosie Cornelius’s baked good are gluten-free, nut-free and vegan. Bestsellers are the cinnamon bun and ultimate brownie. At the Orangeville Farmers’ Market, Deja Vu Diner, and Healthy Cravings Holistic Kitchen. Viki Reynolds of Mulmur’s Not So Hollow native plant farm offers vegan, gluten-free dishes such as cassoulet, spanakopita and masala dosa, along with desserts and salads. 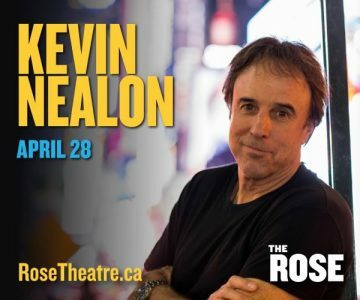 She opens for the season May 4. Janice Quirt is a freelance writer who lives in Orangeville. Try the Nuud “Nothing to Hide” Veggie Squares, made locally (in Concord, I think??) I found them at Garden Foods in Caledon East. Three flavours: orange/mango, apple/cinnamon, and chocolate. They are very good! Thanks for the tip! I’ve seen them at Foodland in Caledon East – is that what you’re thinking of? Thanks for reading! By posting a comment you agree that IN THE HILLS magazine has the legal right to publish, edit or delete all comments for use both online or in print. You also agree that you bear sole legal responsibility for your comments, and that you will hold IN THE HILLS harmless from the legal consequences of your comment, including libel, copyright infringement and any other legal claims. Any comments posted on this site are NOT the opinion of IN THE HILLS magazine. Personal attacks, offensive language and unsubstantiated allegations are not allowed. 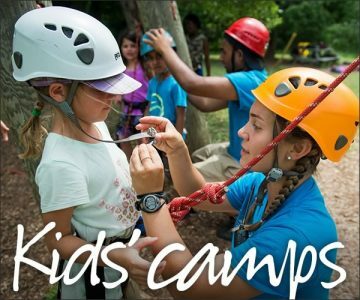 Please report inappropriate comments to vjones@inthehills.ca. 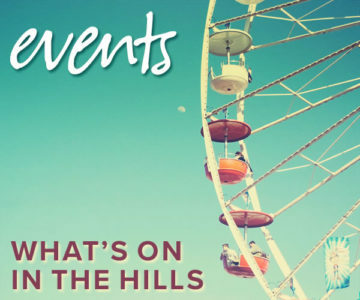 Submit your community, arts or nonprofit event to What's On in the print edition and online calendar of In The Hills. It's quick and it's free. St. Mark’s Church – 5 First Ave. 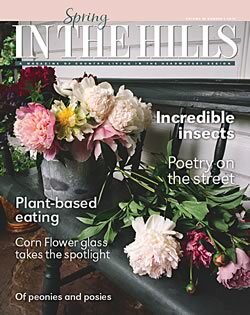 In The Hills is an independent, locally owned print and online magazine that has earned its reputation as the best-read, best-loved magazine in Headwaters. The magazine is delivered to more than 40,000 homes and farms throughout Caledon, Erin, Dufferin, Orangeville and Creemore – up to double the circulation of any other local publication. And it is available to visitors at local inns, restaurants, specialty retail stores and other tourist locations.